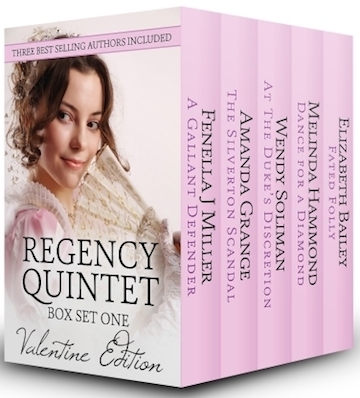 How does a gathering of British Regency authors all together in a box set come about? Well, we’re all members of the Romantic Novelists’ Association, which meets several times a year. We’ve known each other for years, and enjoyed reading each other’s books. It’s fun to share, and we thought it would be of interest to our respective readers to try other authors writing in the same genre. What better way than by putting together a collection of our own favourite stories? Dukes, lords, gentlemen and spirited ladies. Adventures, improbable matches and witty repartee. What more could a Regency afficionado desire? A Gallant Defender by Fenella J Miller, in which the resourceful Eliza Fox joins forces with Mr Fletcher Reed to save her family from villainous Lord Wydale. The Silverton Scandal by Amanda Grange, a rip-roaring adventure with spirited heroine, blackmailer and a lord masquerading as a highwayman. At the Duke’s Discretion by Wendy Soliman. Surely there can be no future for Amos, who is a duke’s heir, and Cristobel, a nobody with a criminal past? Dance for a Diamond by Melinda Hammond, award-winning romance: autocratic Sir Laurence Oakford crosses swords with dance academy owner Miss Antonia Venn. Fated Folly by Elizabeth Bailey, the sweet and poignant tale of the ogre and the minx in a marriage of convenience. Fenella J Miller was born in the Isle of Man. Her father was a Yorkshire man and her mother the daughter of a Rajah. She writes Regency romantic adventures, Jane Austen variations and WW2 historical novels. She lives in a pretty, riverside village in Essex with her husband. Wendy Soliman is a British author, now dividing her time between Andorra and Florida. She adores everything to do with the Regency and spends her days dreaming up inventive new ways to get her heroes and heroines into all sorts of trouble! Melinda Hammond is an award-winning author with more than twenty historical romantic novels published. She was born in England, in the West Country, but now lives in an old farmhouse on the Yorkshire Pennines. Elizabeth Bailey writes Regency and Georgian historical romance, Georgian mysteries and contemporary fiction with a supernatural edge. She lives in Sussex and spends far too much time reading novels on her kindle instead of writing them!